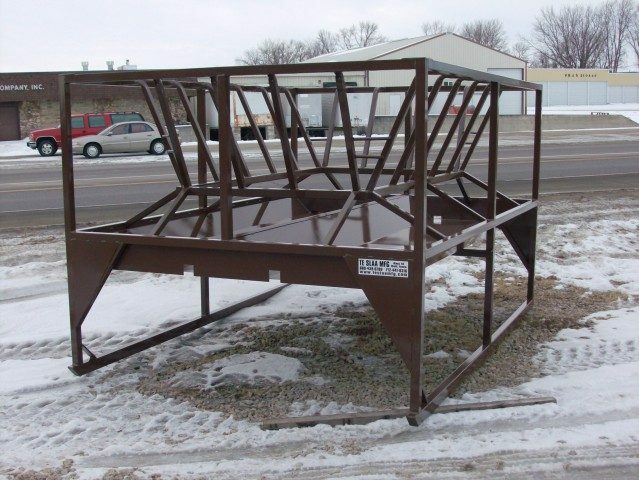 Just like our line of feed-saving hay bunks, our horse round bale feeders are designed to reduce waste while still giving your horses unhindered access to their hay. With the hay tray starting at 3.5 feet off the ground and 7 ft. custom sides are available. They are tall enough for any breed of horse. 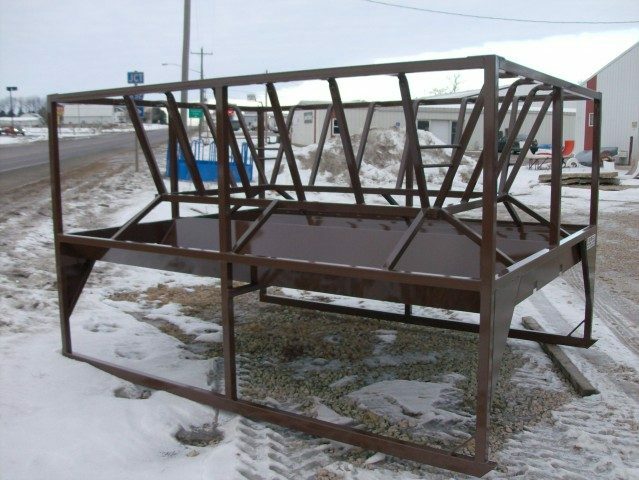 While the hay in other bunks might be contained by a single row of bars on the outside edge of the feeder, our horse skids keep feed confined to the interior of the feeder above a feeder trough. Any forage that falls down ends up in the trough rather than on the ground. A key difference in this model is the open feed design which prevents horses rubbing their mane while feeding. A side effect of this design is that you can use it to feed grain as well as square bales (large or small) and round bales. You save money by reducing waste and eliminating the need for an additional grain feeder. 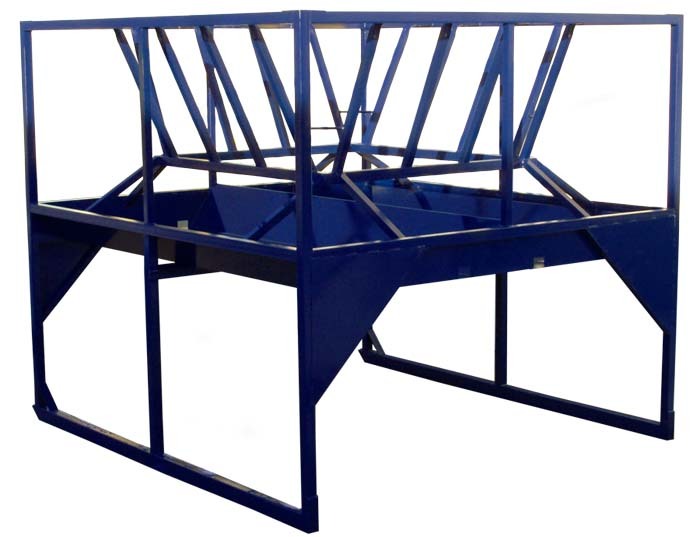 Following in the footsteps of our other proven designs, the horse round bale feeder has a frame built entirely of square and rectangular tubing, to give it strength. A 12 gauge feed pan helps withstand abuse, as well as the weather. All of this means that your Te Slaa feeder will be around reducing feed waste for years to come. 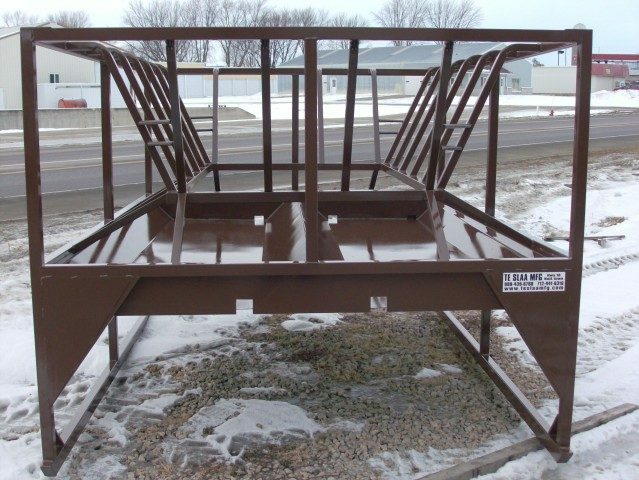 Built on convenient skids, the bunk is also easily moved from yard to yard. • Framework made of 2”x2” and 2”x3” heavy wall square and rectangular tubing. • 1 1/2” 14GA. square tubing used in the hay retaining racks.